One of my favorite quilts of all time. Cocktails On The Beach has begun its journey to Belgium, safely in the hands of its new owner. I made this quilt in 2013 from upcycling mens dress shirts- some thrifted and others nabbed from the men in my life. The pale blues and grays are some of my favorite shades. The bright shots of Kona solids scattered in the corners reminded me of the social event that happens every Tuesday night on the beach, at the tiny island my in-laws spend a part of each year on. Friends meet up for appetizers and cocktails in the early evening. The back of golf carts pulled up to the group become impromptu food tables and drink rests. The sunset is always beautiful and peaceful, a lovely place to be. 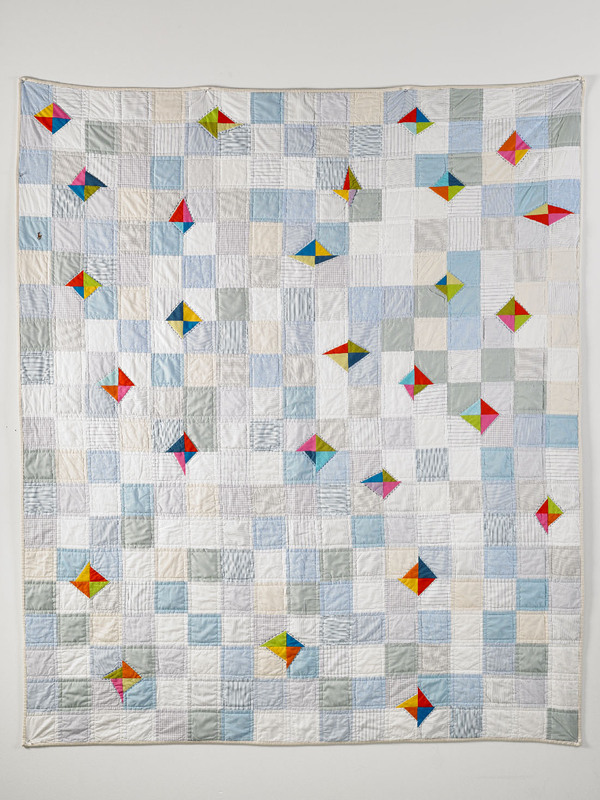 Another source of inspiration for this quilt is a Kaffe Fassett quilt I’ve always loved. You can read more about that and this quilt in this post. I hand quilted around the colored, on point squarish shapes, and the rest is straight line quilting. A play on the feel of the soft, perhaps more workaday somber colors and textures of the men’s shirtings. Just another reminder that real life experiences are always the best inspiration!